Synopsis: A baby girl is rescued from a snowy path in the woods. A baby boy is stillborn. A young Queen is taken ill. An ExtraOrdinary Wizard mysteriously resigns from his post. And all on the same night. A string of events, seemingly unconnected, begins to converge ten years later, when the Heap family receive a knock at the door. The evil Necromancer DomDaniel is plotting his comeback and a Major Obstacle resides in the Heap family. Life as they know is about to change, and the most fantastically fast-paced adventure of confused identities, magyk and mayhem, begin. Angie Sage has provided a quirky and consuming fantasy novel. Sage has taken elements of magic and combined them with her own ideas to make a unique and believable system. Magyk has a multitude of quirky characters, and I think this is what really makes it a great book. Each character is different and not like any other character I have seen before. My only criticism would be of DomDaniel, the evil wizard. DomDaniel lacks a lot of inginuity and originality, making for a bland and cliched villain, which is a real shame for such a good book. This may just be because we see so little of him in Magyk, but it remains to see when you read the sequel. Don’t worry, however, because Sage compensates with at least three main characters, which are humoruous, entertaining and lovable. These characters are what make Magyk what it is. Angie Sage’s writting style is akin to that of J K Rowling and Terry Pratchett. It is light and flowing and yet enthralling to read. Magyk fits very well together, keeping up a high standard of action and action. I found that it was predictable at times, but don’t let that put you off. For inside is a highly entertaining, humourus and enjoyable read. Magyk is both Harry Potter and Artemis Fowl combined, and is a real contender in the book world. 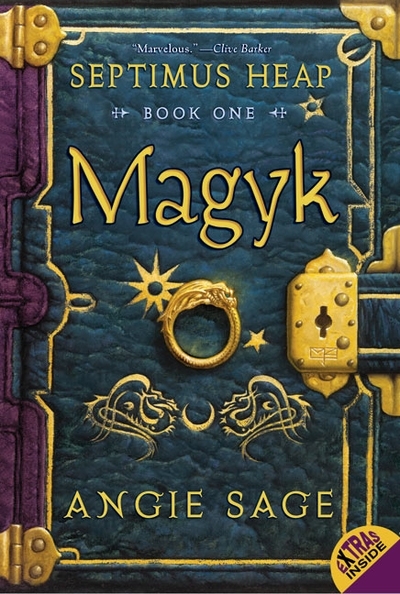 Without a doubt, Magyk is a real page-turner that will have you hooked!